Back in 2007, Apple announced iMovie ’08 would be totally new from the ground up, due to the amazing work of one of the company’s engineers (who we now know was Apple's Chief Architect of Video Applications, Randy Ubillos). Not everybody was thrilled, though: many users found themselves annoyed at all the features iMovie ’08 lacked compared to its predecessor, iMovie HD 6 (there’s a naming scheme I’m glad Apple deep sixed). 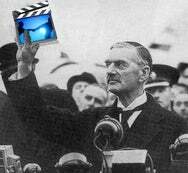 So, in a Chamberlainian move of appeasement, Apple graciously provided a free download of iMovie HD 6 to all registered users of iLife ’08. Problem solved, right? Well, today that era of appeasement came to an end, as MacRumors points out that Apple has removed the download page for iMovie HD 6. It’s easy to see why: iMovie ’09 supposedly brings the re-engineered iMovie up to par with the old one in terms of features. You don’t need iMovie HD 6 anymore, right? In fact, you’ve never needed iMovie HD 6, and we’ve always been at war with Oceania. If you’re itching to hold onto a little piece of the past, you can still download the iMovie HD 6 disk image directly (that’s a download link there, folks) and hold onto it until Steve Jobs pries it from your cold, dead hands. Update 3:19 PT: Whoops, apparently I screwed up the link. But it's fixed and yes, the DMG is still there.